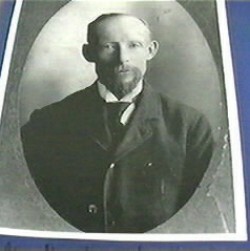 1592C.116 Amasa 8 BIGELOW, son of Justus 7 ( Ebenezer 6 , Amasa 5 , Isaac 4, Isaac 3, Samuel 2, John1) and Olivia (COX) BIGELOW, was born at Medford, NS on 19 September 1835 and married on 05 January 1859 Elizabeth Fullerton who was born 08 January 1839, the daughter of Henry and Phoebe ( ) Fullerton. This family resided in Lower Stewiacke, NS where he owned a mill and general store. He was also known as "Red Beard". Both Amasa and Elizabeth died at North Sydney, NS - Amasa in January 1907 and Elizabeth in 1902 or 1903. Buried in Greenwood cemetery, Glace Bay, (Parrsboro), NS. 1592C.1161t Lillian Belle (Lillie or Lila), b 12 Dec 1860; d ____ ; m 26 (30?) Jan 1880 Arthur Dixon Parker, b 03 May 1859/3, son of Michael Terbune and Mary (Walton) Parker; 6 children. 1592C.1162t Harry Clifton, b 25 Nov 1862; d 14 June 1939 Truro, NS; m 16 Oct 1883 Margaret McNutt; res. Lower Stewiacke; 10 children. 1592C.1163t Joseph Cox, b 06 Sept 1864; d __1943? ; m Maude C. Ambrose (dau of George and Jessie Ambrose; b ca 1863, Lower Stewiacke, NS) ; 2 children. 1592C.1164 Horace Elmer, b 26/7 Sept 1866; d 04 July 1899 Boston, MA in train accident; m 1895 Anna Maria (Rubey) Bummas - her second m, b 13 June 1859, d _ Dec 1906; no children. 1592C.1165 Olive Isora (Izora Olive), b 03 Dec 1869; d _____ ; m 07 Jan 1910 Charles O. Doyle; 5 children. 1592C.1166 Eva Blanche, b 19 March 1872; d 14 May 1875 Kingsport, , NS; died of diphtheria. 1592C.1167t Phebe Wilma, b 19 March 1878 Kingsport, NS; d 13 April 1968; m 06 Jan 1902 North Sydney, NS Harris Lesley MacNeill; 5 children. Colchester co, NS marriage records. Sorry about being so short on knowledge. I am just beginning to trace my family roots and the info I have is very minimal to say the least. The only information on Charles Bigelow I have is (no middle name) his brother was Joseph and his sisters were Izora Olive, Lilla Belle, and Phoebe. They lived in the Glace Bay area of Nova Scotia. He was married to Margaret and bore 6 sons and daughters with a partial listing of Florence Mae, Kathryn, Marjorie and Blanche.....That is all that I can find. If you by chance happen across any of these names I'd sure love to hear it. By either misfortune or ignorance, this side of the Bigelow clan never kept any records of their family tree and as of now there are no living relations that I know of.